Water glasses, mails, keys, lotions, books, jewelries and other knickknacks tend to accumulate on the nightstand, turning it into a real mess. Even if you say you’re used to it, the amount of clutter you have has a big impact on how well you sleep and how calm your morning can be. Imagine reaching to turn off your alarm clock only to knock over your glasses, books, a cup of water and several of your knickknacks? What a stressful scene to start mornings! On the contrary, imagine how relaxing it is when you reach for your alarm clock and nothing gets knocked over. Then when you look for your earrings, your watch, or your keys, you know just where to get them. 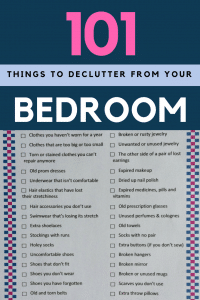 Simply removing the clutter beside your bed can lead to less stress, better sleep, and of course, better mornings! 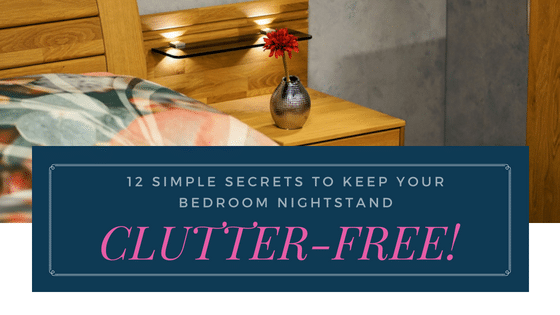 So here is a guide that will show you twelve simple and doable actions to keep your nightstand free from clutter, and keep it that way. 1. Stick to the essentials. Ask yourself… what do you really need on your nightstand? Think about all the things you need just before you sleep, right after waking up, and when you suddenly wake up in the middle of the night to take a little trip to the restroom. You will always need some light, so a lamp is an essential. Depending on the space that you have, you can opt for the traditional lamp, the one you simply place on your nightstand. Or you can choose an overhead lamp that is mounted to the bed or to the wall, especially when your bedroom is really small. If you’re the type who loves to read before sleeping, then have a book or a magazine . When you wake up, has it been your custom to drink a glass of water or read the Bible? Keep those beside your bed. Here is a simple nightstand from my previous post. I can’t help but admire this alternative nightstand from Tiphero. It’s small, does not have a lot of space; but you know why small can be better sometimes? Well.. it forces you to stick to what’s essential. Because you don’t have a lot of room for everything you think you need, you are forced to keep those that you really need. You may have more space than this. 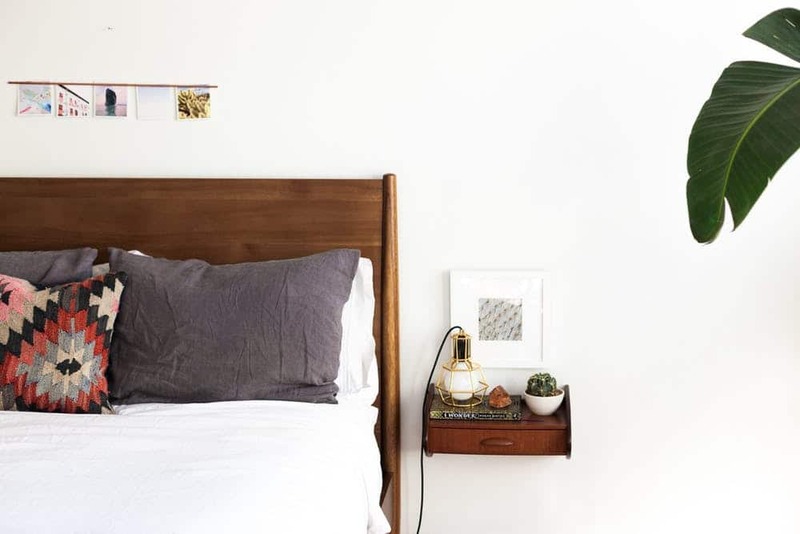 You may have the room for a regular nightstand. But the principle stays the same. If you want a clutter-free nightstand, you gotta know what’s essential for you, and stick to that. 2. Keep one or two books only. I used to pile every book and magazine that I was reading beside my bed. And guess what? They just kept on piling. And it’s not like I’m reading all of them in one night. No! They were just there because I was hoping to read all of them. That never happened. I would only pull out one or two books at night. Sometimes I was too tired to even read a page. So if you have a pile of books that you are currently reading, choose only one or two to keep beside your bed. Once you’re done with a book, remove it on top of your nightstand and put it back to its shelf. 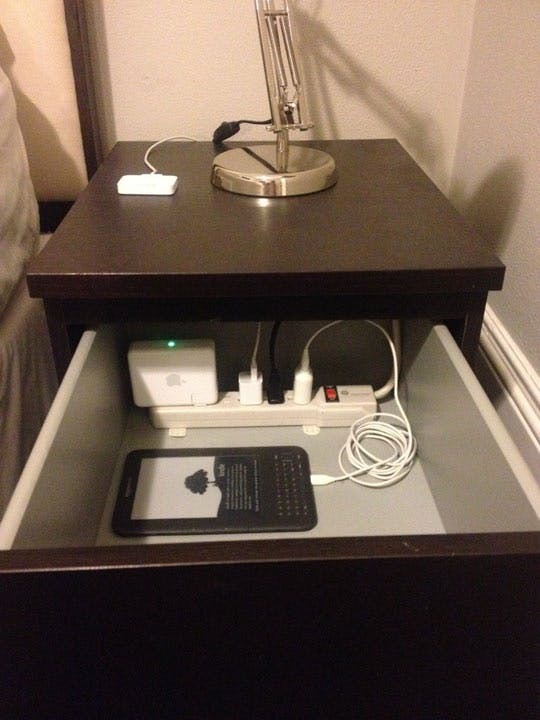 If your nightstand has a drawer, use it to store some of your items. Instead of placing your bedside essentials on top of your nightstand, just keep them in your drawer. If what remains on top is just your lamp, then so much the better – it’s a free and open space, calm and peaceful to look at. Drawers are great because you can keep your things out of sight, leaving you a calming look. However, this doesn’t mean that simply because you have a drawer, you can just carelessly toss your things in there to hide them in plain sight. That is still clutter, just hidden. And every time you open that drawer, your mind absorbs that clutter. So we go back to number 1 secret – stick to the essentials. Even if you have a drawer to hide things away, make sure that what’s inside are only what’s needed and they are are neatly arranged. 5. Use a drawer organizer. 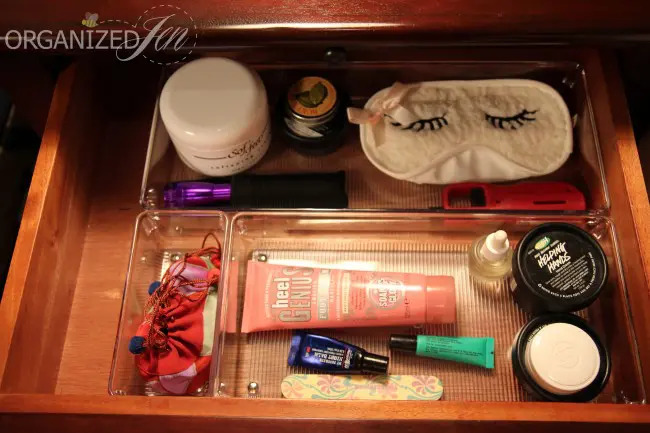 An organizer helps keep the items in your drawer neat and organized. Choose containers with compartments for the smaller items. This drawer from Better Homes & Gardens looks very neat – thanks to the organizers in place! 6. Use bigger baskets if you have no drawers. The Every Girl uses an IKEA Kallax for a nightstand. This furniture has no drawer, but it has extra shelves underneath which is a very good place for storage. Now, can you notice how the baskets are neatly placed? 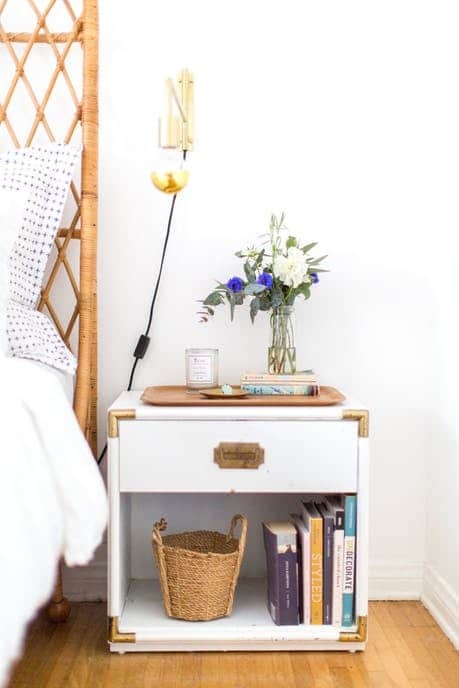 If your nightstand doesn’t have a drawer, but you need something to keep your items, a basket underneath can be just the solution you’re looking for. 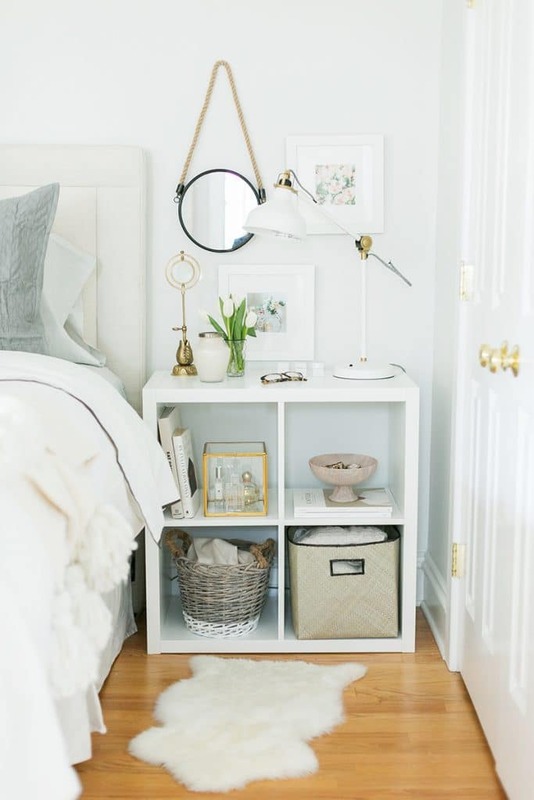 Arrange your things inside the baskets then simply place them under the nightstand. 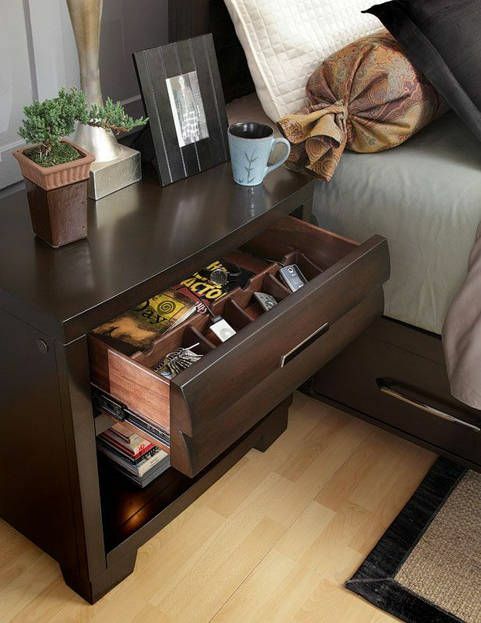 It works perfectly well even if your nightstand does not necessarily have shelves but only an open space underneath. This one is from Sarah Langtry. She turned a wire basket into a rolling book cart. It is easy to just roll it when you need a book, then roll it back under the nightstand. 7. Relocate your charging station in your drawer. I’m gonna say this is really smart! As you know, power strips can be really messy with all our gadget’s cords. So this is great option to hide the mess. If your nightstand allows it, and if you don’t mind having plugs next to your head while you sleep, put your power strip inside your nightstand drawer. 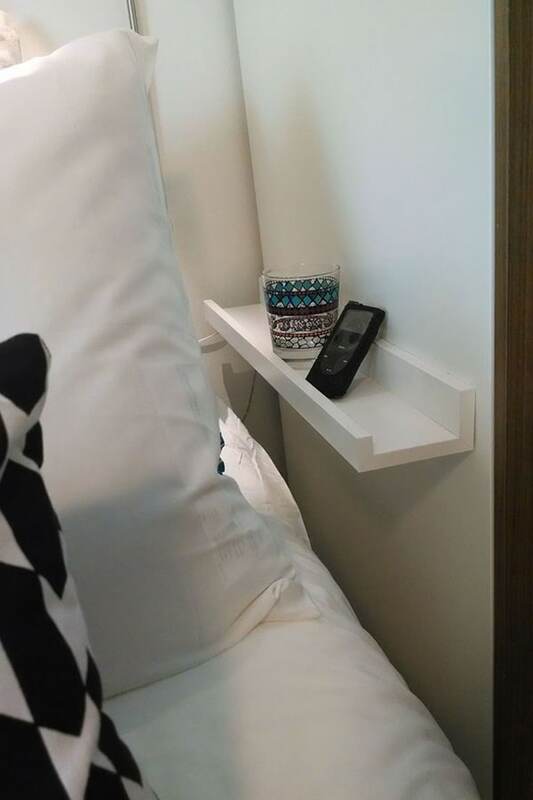 See how Taryn made this possible in her own nightstand. Don’t let your nightstand be a dumping ground for every small item that you have. 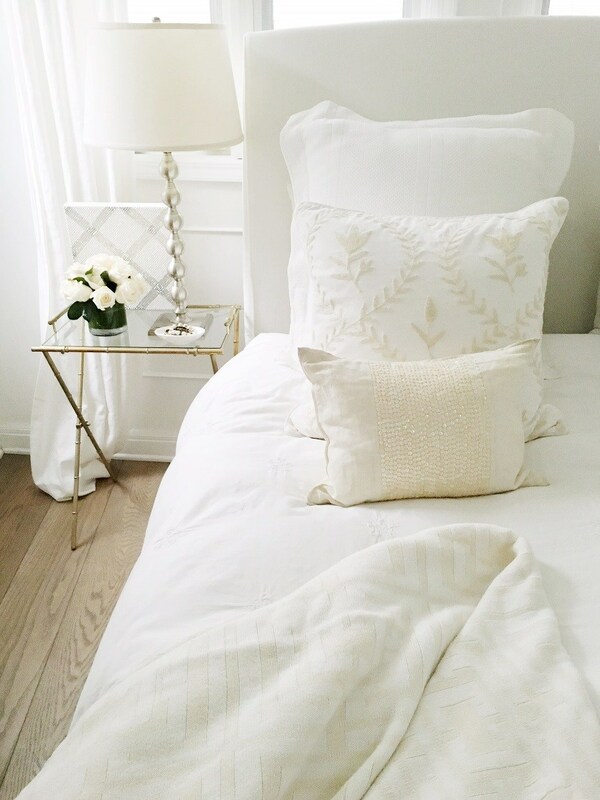 Every night, check whether a particular item should be on your nightstand. If it’s not, where should it be? Take action immediately and put the thing to where to it truly belongs. If it doesn’t belong to any room in your house, then why is it even there in the first place? Put your remotes and chargers in a drawer or container. And don’t let your devices disturb you while you sleep. If you have a laptop, turn it off before you go to sleep and keep it inside your drawers. Keep your phone in the drawer too. You don’t want to be tempted to read messages and check notifications in the middle of the night only to disturb your sweet slumber; and worse, make it hard for you to go back to sleep. Instead of a big notebook occupying almost half of your nightstand space, choose a smaller one. The same goes for lotion, lip balm, essential oils, hair ties and other items you need. 11. Have a small container nearby. 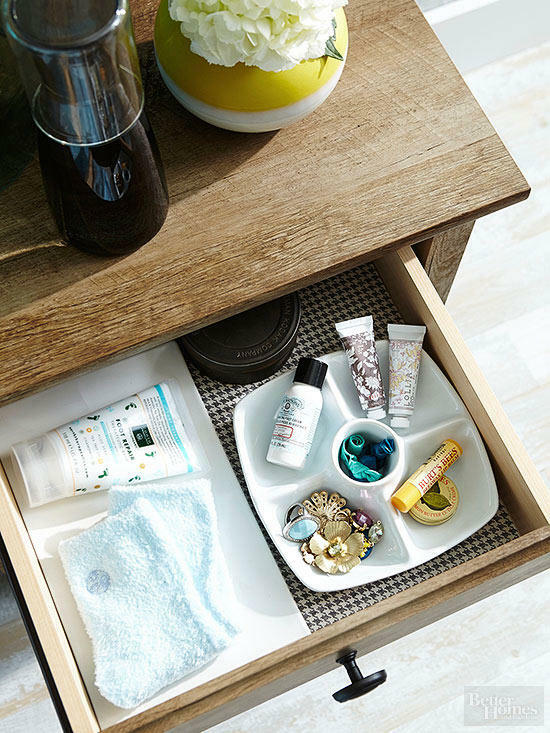 This container will serve as a collector of all your bedside necessities like your watch, jewelries you often use, lotion, essential oils, lip balm, powder and other items you might need. Keeping them together won’t make them look like clutter, especially if you just keep them on top of your nightstand. Coco of Cococozy chose a simple dish, just enough to contain her jewelries. You can also use a ceramic cup. If you need more space for your essentials, opt for a small basket or a cute tray. 12. Leave room for the little things you love. Would a bouquet of fresh flowers ease your mind from all the concerns you have to tackle during the day? 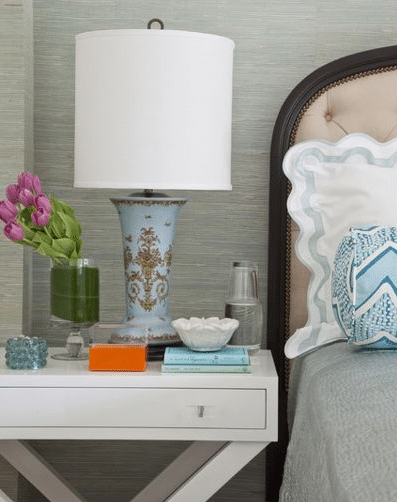 If decorative pieces make you happy and help you to relax, then leave a little space for them on your nightstand. 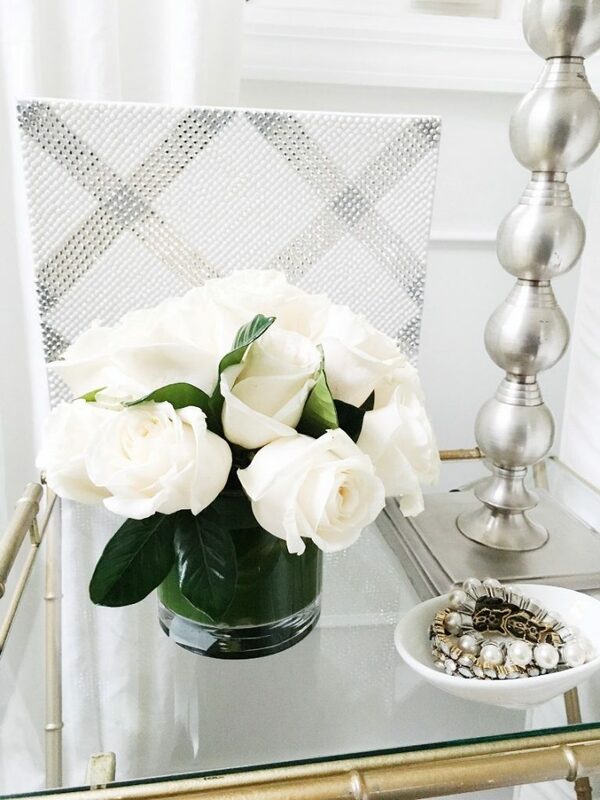 It could be just a small vase for fresh flowers, like what you’ll find in Megan’s room. Other items you might find calming could be a cute cactus, a scented candle, a picture of your loved ones, a quote in a frame, or a small piece of artwork. Thank you for reading up to the end of this guide. 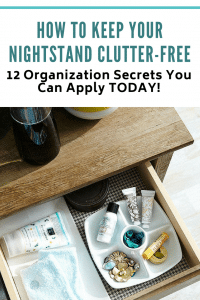 Start implementing the advice you find here and you are on your way to a clutter-free nightstand! You may be a messy person. 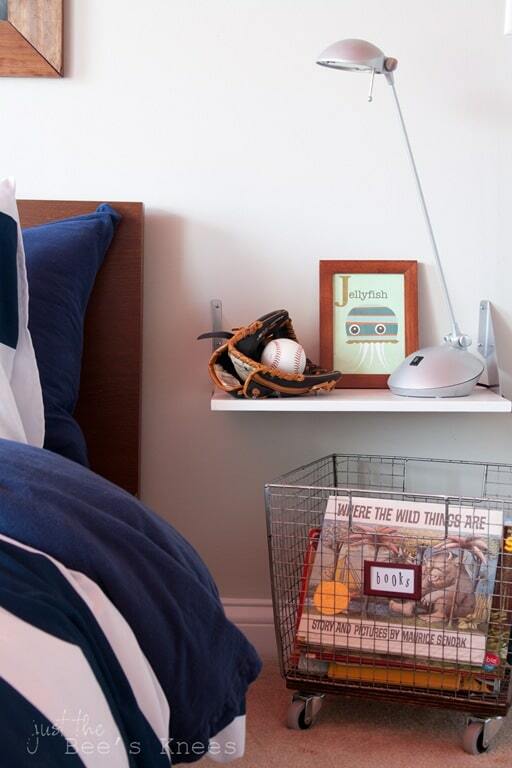 But you don’t have to be an organization pro to keep your bedroom organized. Little steps do pile up. And today, simply taking action to clear your nightstand is enough. 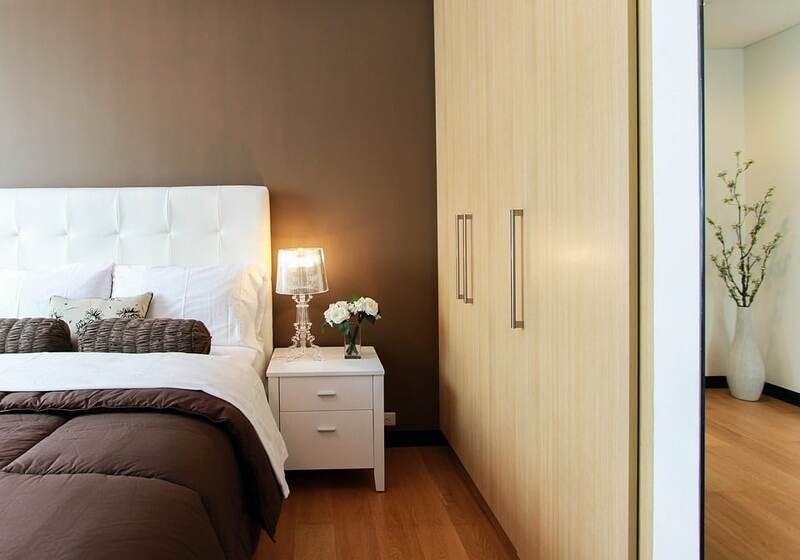 What’s important is that you stay consistent until you get everything in place, and finally achieve the organized bedroom that you have imagined. 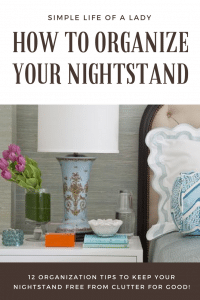 Do you have more tips that can keep nightstands clutter free? If you do, feel free to leave a comment. I’d be very much glad to know about it! 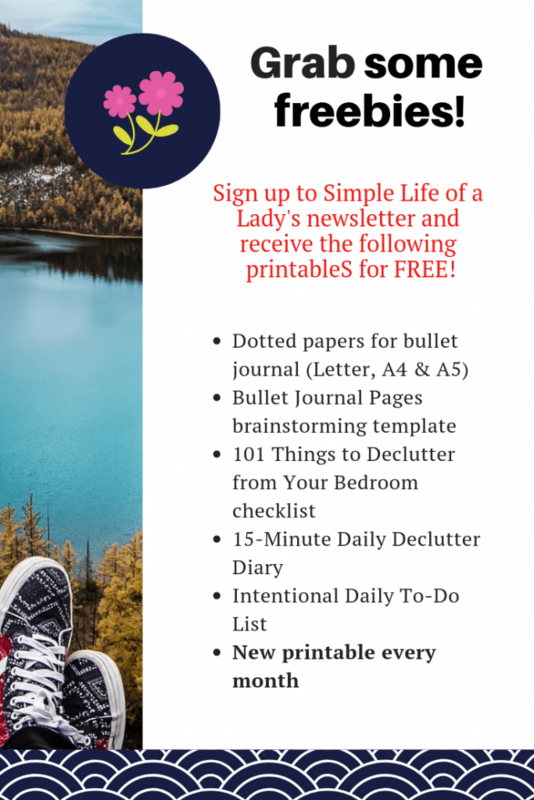 Better yet, get the entire freebie package by joining Simple Life of a Lady’s Newsletter! And as long as you are a subscriber, you will receive a free printable every month… for life! Found this article helpful? Take a second to PIN it. 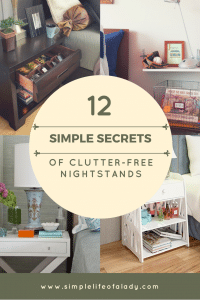 Let’s help others achieve a clutter-free nightstand!